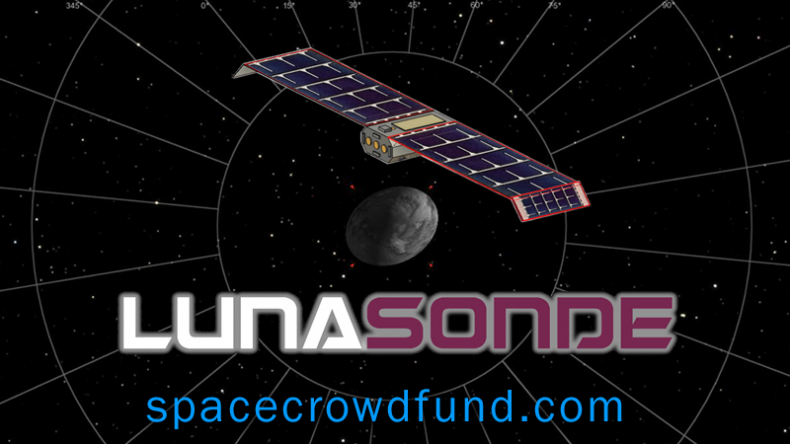 LunaSonde represents a new facet in space enterprises by creating low-cost spacecraft for subsurface Earth, Lunar and Asteroid observation. They are also developing a comprehensive data framework to analyse this valuable raw information. The technology used for Asteroid Prospecting is a prerequisite for Asteroid Mining. Their next activity will be the launch of Gossamer-1 in H1 2018, a technology demonstration that tests several subsystems to be used on their Saberwing satellite. Phase 1 budget is $300,000-$500,000, which covers all research and development for both Gossamer and Saberwing. They have raised 5% of their total budget, with a portion applied toward reserving a launch to LEO. They are looking for space investors to raise the final amount. As an emerging space startup they offer a good return on investment because their technology caters to Earth Observation and Space Resources. Phase 2 budget will be larger, and includes the launch cost on a Falcon 9 rocket to GTO. Lunasonde is entering the NASA Cube Quest Challenge. They are a new space startup raising funds on Space CrowdFund to assist in the establishment of their own company and entering the NASA Cube Quest Challenge. 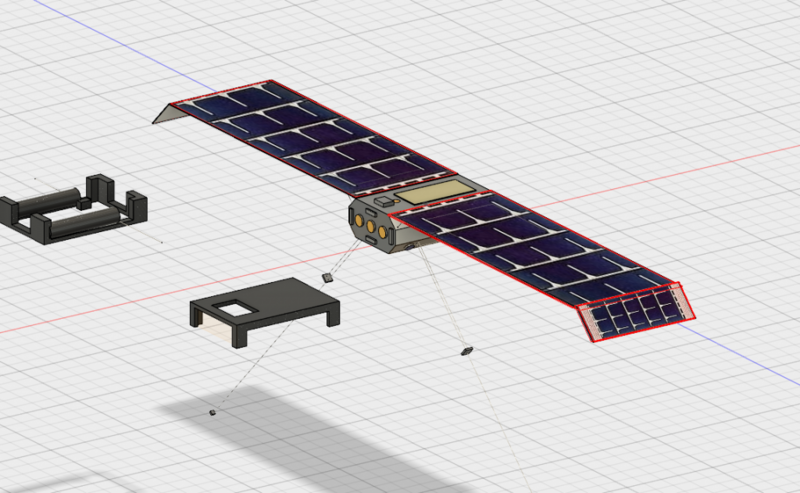 LunaSonde’s entrant is Saberwing, a satellite that will demonstrate several unique technologies, including the ability to conduct exploratory asteroid mining missions. The mission profile is to fly a gravity assist past the moon and onward to near earth object 2008 HS3. Onboard sensors will then detect the structure of the asteroid, and the presence of certain materials within the asteroid. Visit the Jet Propulsion Lab for more informaiton on Near Earth Object 2008 Hs3. Lunasonde have developed a plasma thruster that has the potential for massive improvement over Hall-effect thrusters and gridded ion thrusters. The actual design is based upon a 60 year-old prototype that has been coupled with modern ultra capacitor technology. By accelerating ions in a traveling-wave configuration, a deep space target can be reached faster than using alternate propulsion. The Saberwing and CubeQuest mission to 2008 HS3 will demonstrate asteroid prospecting technology that can be used to provide valuable raw data to asteroid mining companies. One of the team members is working on a compact muon tomography platform which can be used to see beneath the surface of near earth objects and determine their internal composition. Read more about Muon Topography here. The subsurface detection technology can be used on Earth, and is can be extended to prospecting for resources in space. The team leading LunaSonde offer a fresh and innovate prospective to scaling up the space economy. They can also rely on the expertise of several seasoned space tech veterans. Jeremiah Pate, 18, President and Product Architect, designed data-mining software to develop treatment for Parkinson’s disease/Intel ISEF winner. Collier Moody, 18, Vice President of Astrodynamics and Software Development, designed patented optimization software for drone aircraft engines. Sloan Kanaski, 19, Vice President of Concept Development, designed a novel subatomic particle detector to aid in the search for vector-like quarks. Read more about Lunasonde’s Executive Team. Minimum Investment: USD$2,000, or equivalent in your own currency depending on Foreign Exchange rates. By supporting this project you are not legally obliged to invest, simply support to show your interest. You will not be asked to transfer any funds. You can decide to invest at a later stage. Private Space Companies; From the start-ups to large ventures. Publicly Listed Space Companies; By investing directly in our Space Stocks Portfolio (to save on administration costs). For Private Space Companies, making long-term strategic investments in new and existing space companies that are meeting current or future demand, e.g. Space Tourism, Small Satellite Communications, Launch Solutions. For Publicly Listed Space Companies, holding long-term strategic positions, and trading on Short-term micro trends. Prospective space investors can see the progress made by small and large space companies, but it is difficult to invest directly in them. Often larger companies have a high minimum investment threshold, and smaller companies are too difficult to understand by new investors. So that small, retail and private investors can invest in space, the Space Commerce Portfolio is a managed and risk averse broad investment in commercial space companies. 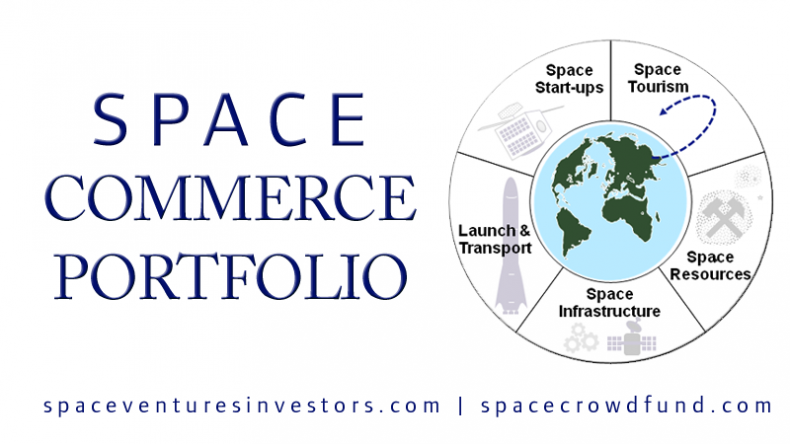 The Space Commerce Portfolio is designed for retail level private investors and firms that want to invest in ‘space commerce’. As an individual you can commit US$2,000 or more. As a company you can commit US$10,000 or more. Satellites (manufacturers, owners and operators) and the satellite communications global infrastructure. Large Aerospace Companies (market capitalization is over US$500m). Small-Medium Space Companies (market capitalization under US$500m) including niche Space Technology like Space 2.0; Data, Robotics, and Energy applications for in space. Space Company IPOs: We evaluate what space IPOs are worth investing in. Space Tourism: Private companies that are developing sub-orbital and orbit space tourism craft. Space Resources: From Asteroid Mining to Lunar Bases, Space Resources as an investing theme is alternative and exotic, and return on investment expectations are in decades, not years. However, there are new companies focussed solely on extracting resources (e.g. water) and wealth from the abundance of material in our solar system. Space Resources is a disruptive industrial development that will change global economies and space capabilities forever. Space Infrastructure: The space infrastructure in place now for global communication and support space missions will continue to grow as space scales-up. Included in Space Infrastructure is the cleaning up of Space Debris, an important part of keeping all space technology operational. Launch & Transport: The move from rockets to re-usable rockets, plus the use of horizontal take-off planes to reach space, will lower the cost of entry to space. Space Startups: NewSpace and Space 2.0 Startups include downstream data applications, robotics in space, in-orbit energy capture and storage, nano / small satellite swarms, and much more. This is an exciting area because young hi-tech talented individuals and teams are applying themselves to new cheaper, smarter and more accessible technology. Precious Metals, Bonds: Long-term capital preservation. 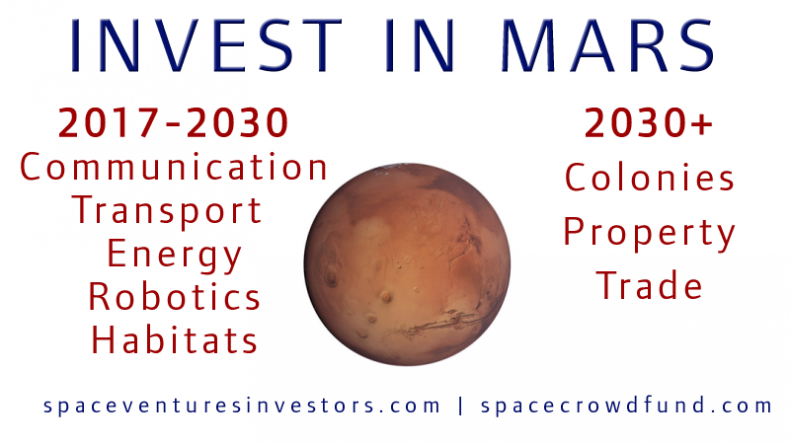 This is an evolving Project on Space CrowdFund – Show Your Support for Investing in Mar. The history of human exploration has taken a brief pause due to the digital revolution. Now that space technology has advanced, humanity can continue to explore, and instead of the old world conquering the new world, it is time to colonise off-world. To be part of this natural progression, you can Invest in a Mars. Getting people and equipment to Mars is an industry within itself, and is built on lower-launch-cost businesses plus numerous companies (many listed on stock exchanges around the world) that develop the technology and talent for Space 2.0. To fund a Mars Colony investors must accept that the longevity of their investment may be twenty years, but profits may be available as dividends within five years, or earlier. Investing in Mars is not just investing in companies, property and materials developed on Mars, it is primarily and predominantly utilising funds in a strategic manner to invest in the infrastructure that supports missions and then subsequent transportation to Mars. Some of the technologies include, and can be invested in right now, long-distance communications, robotics, launch providers, and space habitats. 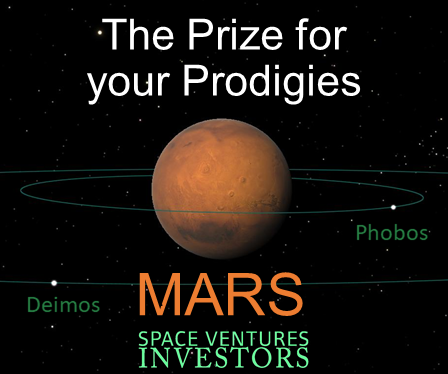 The goal of Investing in Mars is to create a profitable company that invests in the space infrastructure required to colonise Mars, but to also realistically develop value and return profits every year to investors on Earth. Choose Your Own Investment Level. Funding for Invest in a Mars Colony will be open for a 3 Year Period.